Kurtz Ersa North America, a leading supplier of electronics production equipment, exhibited at this year's IPC APEX EXPO, taking place in the Las Vegas Convention Center. 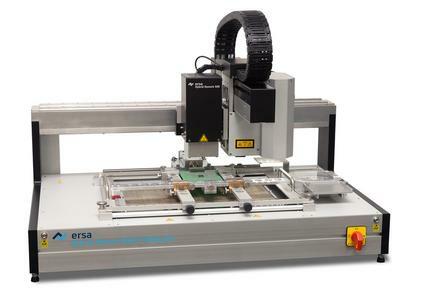 Ersa introduced its new line of selective solder, reflow and rework equipment and more. With the VERSAFLOW 4/55, Ersa presents the next generation of the worldwide leading VERSAFLOW inline selective soldering system, offering a full range of new features: the new, intuitively operable, award- winning user interface ERSASOFT 5.0, motorized adjustable Y-axis for fluxer- and solder module, Y- and Z-variability, full convection preheater and a 508 x 508 mm usable process area for inline production. Through the perfect interaction of all system components, the process flexibility is once more increased and the productivity is further optimized. The Ersa stencil printer VERSAPRINT S1-3D combines precise stencil printing and 100 percent 3D-SPI in one system – featuring the smallest footprint. The VERSAPRINT stencil printers with integrated 100 percent post-print inspection have successfully established themselves in today’s market for electronic manufacturing equipment. Extending 2D inspection, Ersa now presents the VERSAPRINT 3D-SPI – with even more process control and still minimal floor space requirements. ERSA’s ROBOPLACE rings in a new era in man - machine collaboration during the soldering process. With its flexible dual-arms technology it frees up the operator to turn to more demanding tasks. While it does not replace the operators, it rather permits their transfer to perform higher-valued tasks. The lean-concept in combination with the SMART-factory is implemented, and a link to Factory 4.0 (Industry 4.0) is prepared. The Ersa Hybrid Rework System HR 600/2 forms the base for the VOIDLESS Rework System. In modern electronic manufacturing, components with solder pads located on the underside of the component body are often used. During the reflow process gas inclusions in the joints have occurred, the so-called voids, which can, especially in power electronic applications, cause premature field failures. Reworking the assembly is therefore inevitable, and just for this type of rework, the Ersa Hybrid Rework System HR 600/2 VOIDLESS has been developed. With the Ersa Hotflow 3/20 VOIDLESS, Ersa presents a process efficient solution to minimize the occurrence of voids, which is characterized by its high throughput in inline operation, short process times and low operating costs. The VOIDLESS module, for which no additional maintenance is required, can be activated /deactivated at any time and reduces the occurrence of voids when compared to other soldering processes by up to 98 percent.